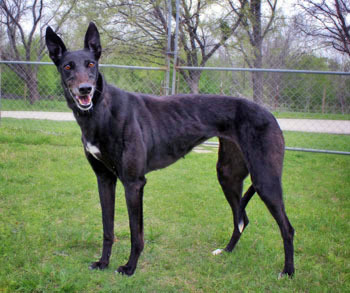 Darlin, aka Rock N Darlin, is a 6-year-old black female born July 26, 2005. Her sire is Late Late Show and her dam is ICU Darlin Dog. Darlin has no races to her credit on Greyhound-data.com, however she does show 86 races from 2007 to 2009 on Trackinfo.com. 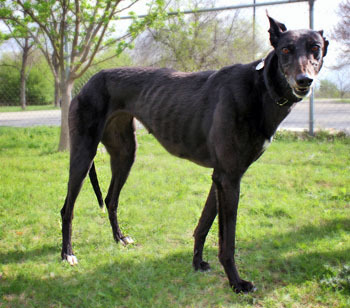 Darlin went on to whelp a litter of four registered puppies on January 31, 2010 with sire Dragon Fire. 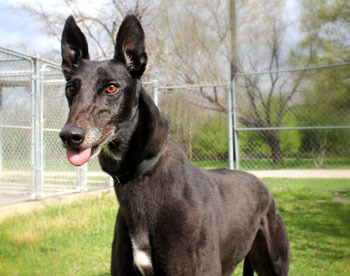 Darlin has her radar ears scouting out her perfect retirement home! Darlin was curious about the cats, but easily called off. She then showed very little interest.